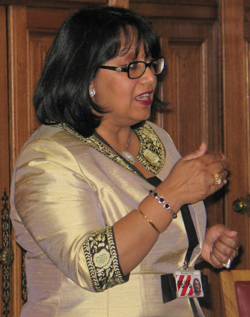 On March 12th Baroness Sandip Verma hosted, in Committee Room 4 of the House of Lords, the 2012 celebration of UN International Women's Day organised by UPF UK and its partners, Women's Federation for World Peace (WFWP) and the Association for the Development of Mongolian Women in Europe (ADMWE). The spokesperson for the Cabinet Office on Education, Equalities and Women's Issues opened the event stating, that progress had been made in terms of the standing of women in society, but “we are still away from a world in which women can live free from fear”. She continued to highlight women's central role as agents of economic change and development. Baroness Verma ended on the note, that women's empowerment shouldn't be about hating men. “The greatest things I could achieve was due to the help of men. Men need to be part of the solution.” However, she added, that the British Parliament, that is often described as the 'Mother of Parliaments', had only produced 31 female Cabinet Ministers in all of its long history. The UK could learn from some African nations where over 50% of politicians are women. Yebuny Chandler, a Cambridge graduate teaching now teaching in one of the countries least performing schools under the 'Teach First' programme, gave insights in the challenges she faces, when it comes to empowering girls in the classroom. "For girls to contribute I found it is very important to create an environment they can feel safe", the young teacher said. She was shocked to see about how dominant fasion became in the life of school girls in finding their self-esteem. The sexualisation of role models for girls and young women was also picked up in the engaging discussions that followed. One Mongolian business lady expressed her desire to work together with other women in defining and promoting new role models. This idea resonated with many of the engaged participants in the room. Elizabeth Crowther-Hunt LVO, the Chief Executive of Westminster Business Council, explained that women entrepeneurs are a largely untapped resource in the UK. She described how the Business Council seeks to empower women entrepeneurs through advice, networking opportunities and suggesting experienced business mentors to support new entrepeneurs. She mentioned that she holds regular 'WOW' events for Women Of Westminster and is looking forward to working with Mongolian women in future. 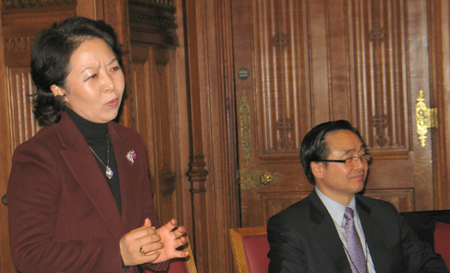 Enke Enkhjargal, (photo left) President and Co Founder of the Association for the Development of Mongolian Women in Europe (ADMWE) as well as the Chief Representative of the London Office of the Bank of Mongolia, spoke about the purpose of the ADMWE and the auspicious and historical context of this event. She explained that Mongolian society had only 4% women politicians. Even Afghanistan, with all its problems, was doing betterwith 24% women politicians. She spoke of the need for more women politicians in Mongolia to bring a better balance within the nations policies. Link to the speech of Mrs Enke Enkhjargal Danzanbaljir, President and Co Founder of the Association for the Development of Mongolian Women in Europe. 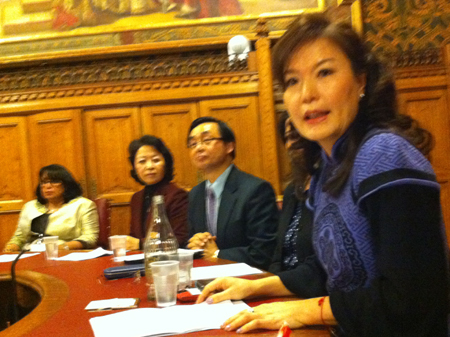 Link to the speech of Mrs Hai Ok Lee Song, Senior Advisor to WFWP in Europe. Link to the speech of Mrs Mitty Tohma, President of WFWP in the UK.